While here in Liberia - I noticed that shoplifting is not as much of a problem as it is in the US. I personally observed a local stores "loss-prevention" technique. A guy was attempting to steal a roll of duct tape from the store. Immediately several clerks from the store proceeded to beat the shoplifter about the head and shoulders while kicking at his legs. The store owner finally intervened when the shoplifter was trying to pull the duct tape out of his pants. One of the clerks was still over enthused about carrying out the loss prevention measures that he was still hitting the guy while he was trying to turn over the goods. Once the tape was retrieved and a couple more cheap shots by the clerk, the shoplifter was thrown out of the store. But the story does not end there. proceeded to chase the shoplifter down the street. 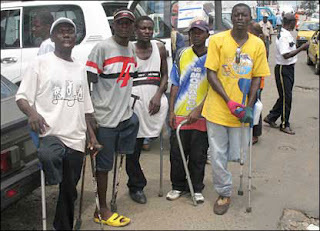 One of the one-legged guys was hopping after him while whacking him with his crutch. 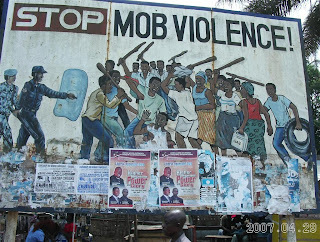 In Liberia they like the idea of MOB Justice. Unfortunately, I do not have photos of the actual incident, as I had forgot to bring my camera with me on that trip. That is craziness. Yet another reason to be happy that I live in boring old Idaho lol. Wow, poor guy. I wonder what he needed the duct tape for? Was it worth the risk? Chell - Do not come to Liberia and shoplift!! There, I reminded you. Jackie - I have no idea - maybe he was going to become a "sticky bandit"